Yes, so perhaps “Band of the Week” has been discontinued, but at least we could still call this “Band of the Indefinite Time Period” if we wanted. Anyway, I’ll cut to the chase. I’m just now getting into a band I’ve known about for a while but only based on one song. That band is Texas quintet Fair To Midland, and that song is “Dance of the Manatee.” I heard it on the radio about two to three years ago, and it immediately caught my attention. However, much to my own personal shame, I inexplicably did not really check out much else of the band’s material. I have redeemed myself however, and I can thank another song of theirs that I heard on the radio — “Musical Chairs.” This song also captivated me on the first listen, and I realized that since Fair To Midland was now 2/2 for me, I had better check them out. I sampled a few more songs on YouTube and decided it was time to purchase a CD. 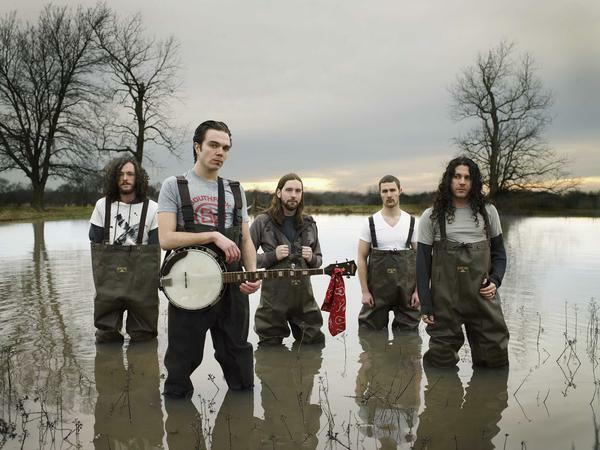 I got their major label debut from 2007, entitled Fables From a Mayfly: What I Tell You Three Times Is True. I have immediately fallen in love with it, and I now have to seriously consider buying their recently-released album, Arrows and Anchors (“Musical Chairs” is on this album). 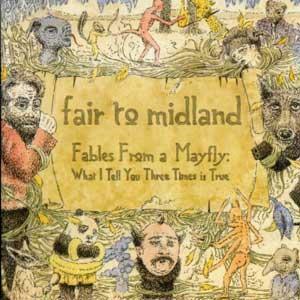 Fair To Midland is a different a nimal. I have trouble classifying them. I would call them a combination of art rock and progressive rock/metal, with a little bit of an indie-type sound thrown into the mix. Vocalist Darroh Sudderth has a truly unique voice and timbre, and his range is unbelievable (just check out the high-to-low vocal progression in the chorus of “Dance of the Manatee” to see what I’m talking about). At times the band has a very soft, keyboard-heavy sound (such as in the intros of “Kyla Cries Cologne” and “Walls of Jericho”), and at other times, thrashing guitars dominate (e.g., the beginnings of “Dance of the Manatee” and “Upgrade^Brigade”). The dynamics within the songs also change rapidly, which makes me use the word “progressive” when describing them. If anyone has an interpretation for this, please let me know. All I know is that I love the way this band sounds, and that’s enough for me. It’s always a cool feeling when you discover a musical group that is awesomely talented but relatively unknown. That’s what I have here with Fair To Midland, so you should thank me for letting the secret out! In all seriousness though, most people will probably like at least some of what they hear; the band’s sound is eclectic enough to attract a plethora of different listeners. I don’t think a long comment here will do as much justice as a short one. Alright, I think I’m on board. This song deals with prostitutes (or “Marys”) who are being persecuted. When vocalist Darroh Sudderth sings in a higher pitch it is the voice of the Marys, and when he goes lower it is the voice of the angered man telling the story. In the lyrics, “Hang us! Those limbs hold no virtue, those told to hold project on my cue,” The marys begin a sentence then the man makes a separate statement that also finishes the Marys’ sentence, which creates a double meaning. This is the perfect example to give when discussing hypocrisy, because it can bring together people from different viewpoints. Also of note, I don’t know if you know this, when you get a long comment on a blog post those words are registered by Google and it helps a lot with SEO, which would be why I try for comments.